In the last issue I built a cabinet to contain some, but certainly not all of my collection of hand tools. 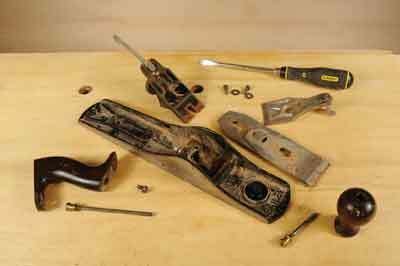 In each issue I will look at a particular type of tool and what to buy or restore and how to use them. To start with I will look at a cast iron hand plane which can then take its place properly in my newly built cabinet where it will be safe. If you don't already own a hand plane or want something better than you already own be careful. 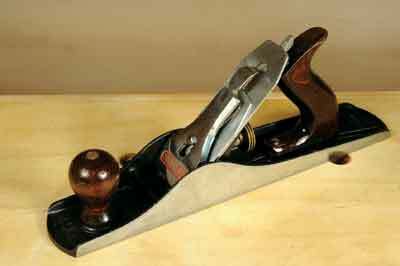 There are plenty of very cheap imported cast iron planes on the market. Some of them are quite good apart from the quality of the blade steel which lets them down. Another major concern is how flat the soleplate really is. 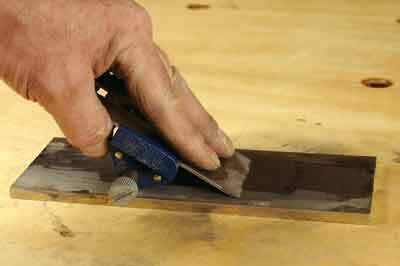 A No.4 smoothing plane seems like a good idea but it is better to learn planing skills using a larger No.5 jack plane as a No.4 will come in handy later. 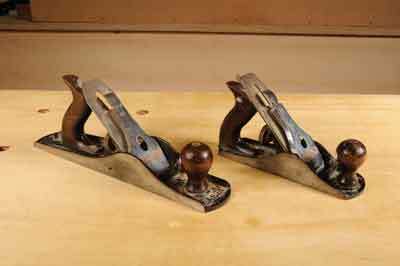 However, it is often better to buy an old well known brand of secondhand plane such as Record or Stanley; these can often be found on eBay, or a secondhand tool dealer in your area, or maybe you can acquire one from a retired craftsman who is hanging up his tools. 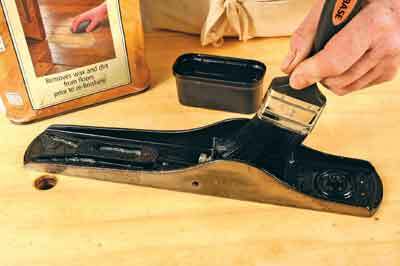 It can be difficult to know the age of the plane you are looking at but the presence of heavily lacquered wooden handles rather than plastic and an original box sometimes with the old waxy paper wrapping can be a better guide to age. Simply being tatty or rusty doesn't prevent such a tool from being brought fully back to life again. Study the condition of your plane, this No.5 jack looks bad but it just needs some TLC and it will be fine. Remove all components from the casting, cap iron, plane blade, chip breaker, cheese head screw, the frog - mounting for the blade assembly - and associated bolts and height adjustment knob; also remove the handles and rods that fix them in place. In all cases use a slot head screwdriver that fits the brass nuts correctly so you don't damage the slots as they are softer than steel. Use a cleaning or dewaxing solution and an old toothbrush to scrub the paintwork on the casting. Wipe the whole thing dry and you will probably find the finish is perfectly alright but if not you can prime and repaint it. The next bit involves hard work, repetition and a bit of muck! 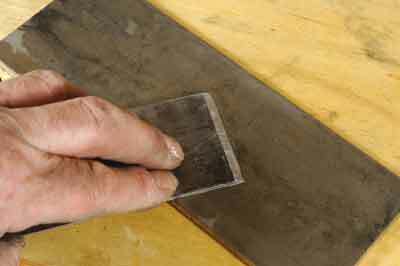 Use a reliable straight edge to check the flatness of the base and sides. Even an old plane can have an untrue sole and may have been used like that all its working life. However, we want to improve on that for really good planing results. Find a really flat surface and spraymount some 600 grit emery paper to it. This can be easier said than done because, if you use a thick piece of float glass as usually recommended, it isn't necessarily as flat as claimed and glass can flex sitting on an uneven surface. Check that you have a reliable surface - a cast, ground machine table is often a better answer. 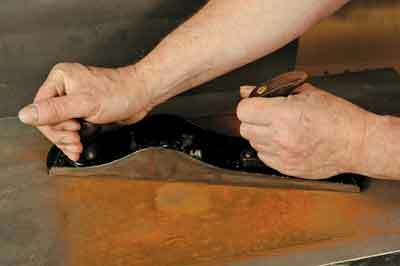 Move the plane body back and forth to grind off the rust and show which are the high and low areas on the sole. The sides can be done as well but these are less critical as they will only be needed when shooting end grain with the plane on its side. Once one sheet becomes unduly contaminated you can lift it off, clean the surface and replace with another sheet and repeat the operation. This will take some time and effort to get right. Once the sole is looking fairly even from end to end, change to 1,200 grit to give a near mirror finish to the sole and sides. This will not only look good but it will help the plane glide on the wood, something wooden bodied planes do naturally. 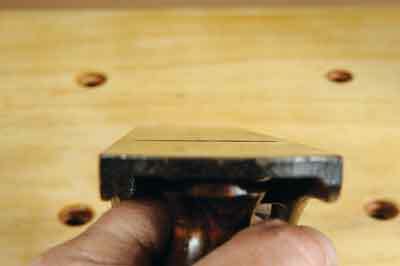 File off any burring on the brass slotted nuts and use fine wire wool to give them a shine. 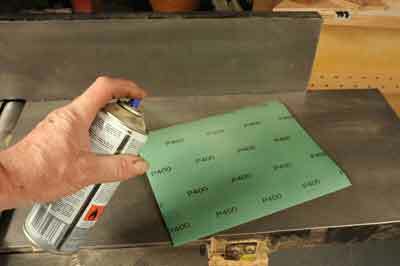 Clean all other metal components; rusty blade components can be rubbed down with emery paper. Refit the blade adjustment knob and then the frog so it lines up with the bevel in the edge of the mouth so the blade will lay properly and square. There is a screw adjustment to move the frog to the correct position. The handle and knob were originally coated in a thick lacquer which over time will craze and start breaking off. If this has happened you need to use a comparatively safe paint stripping agent to persuade it all to come off. Observe the correct safety precautions when doing so and be aware that traditional methylene chloride type strippers can no longer legally be used except under certain specific conditions. Scrub the woodwork gently with a dewaxing agent so the dark stain in the wood isn't affected but all residues from stripping are removed. I prefer a less treacly finish to replace the old; it isn't so hard to the touch and looks better. 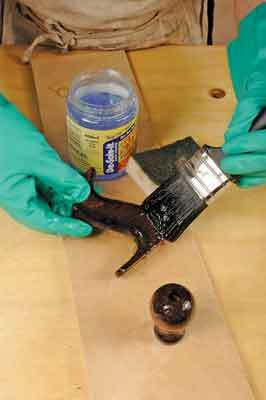 You can use anything from a light spray lacquer followed by wax polish to a hard oil finish. 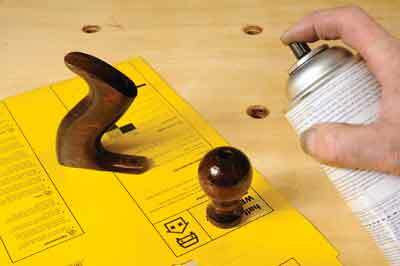 Use '0000' wire wool after the first coat to give a smooth silky feel before completing the treatment. Refit the handle and knob. Your plane should look not so much good as new as 'right' and ready for action. The blade though, is another matter. 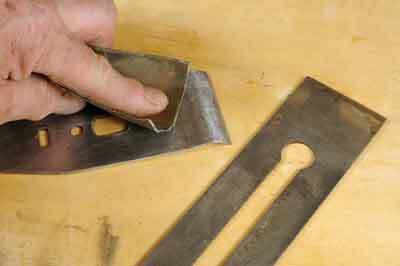 Use fine emery paper to remove rust from the chip breaker and the main body of the blade but stay clear of the edge as this will clean up with sharpening. Any edge tool has two bevels to it. 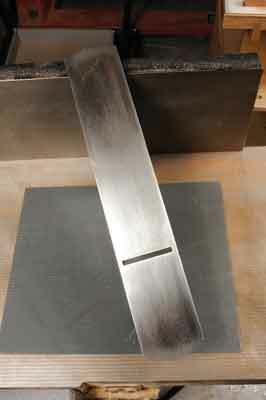 The first is the main bevel ground at an angle of approximately 25°, this is done on a bench grinder of some sort. Many woodworkers have a dry grinder. Unfortunately the heat generated can cook the edge of the blade and cause the metal to 'lose its temper' which means the metal is no longer the correct hardness to cut. You need to keep a water bath nearby to keep cooling the blade. The last thing to watch is getting a level grind across the blade. Check this with an engineer's square if you are concerned. You need to get this right so the blade edge stays square when you come to honing it afterwards. 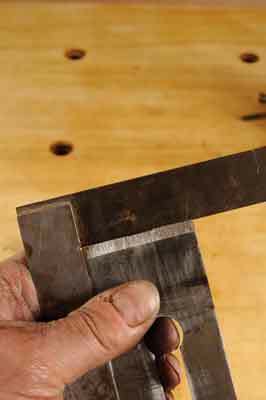 The next step, having created a good consistent ground edge is to create the honing angle or what is often referred to in woodworking as the 'micro-bevel'. This is critical as it is the one you will cut with. This angle is approximately 5° higher than the grinding angle. For simplicity I have used a 1,000 grit diamond plate although there are other stones and sharpening methods available that would also be suitable here. 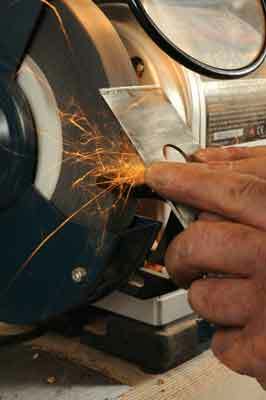 However, the only true way to keep the blade at the correct angle is to use a honing guide. 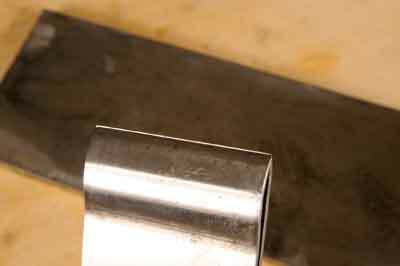 Once you have an apparently sharp edge on your blade you need to remove the honing guide, turn the blade over and lay it flat side down on the workbench. You can then rub in a sideways motion to remove the 'wire edge' that has been created by sharpening. You should now be left with a basic edge that should cut. The chip breaker of the plane is screwed to the blade so the blade edge is just visible along the edge of it. This assembly now mounts on the frog so the projecting height adjustment peg locates in the hole in the blade. You can now wind the height adjustment until the blade just projects when sighted along the plane sole. The long lever underneath the blade is pulled sideways to get the blade projection even right across the sole width. 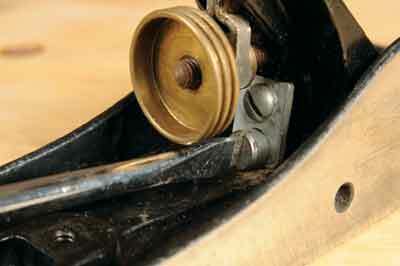 Our Stanley No.5 jack plane is now rejuvenated and ready for action.